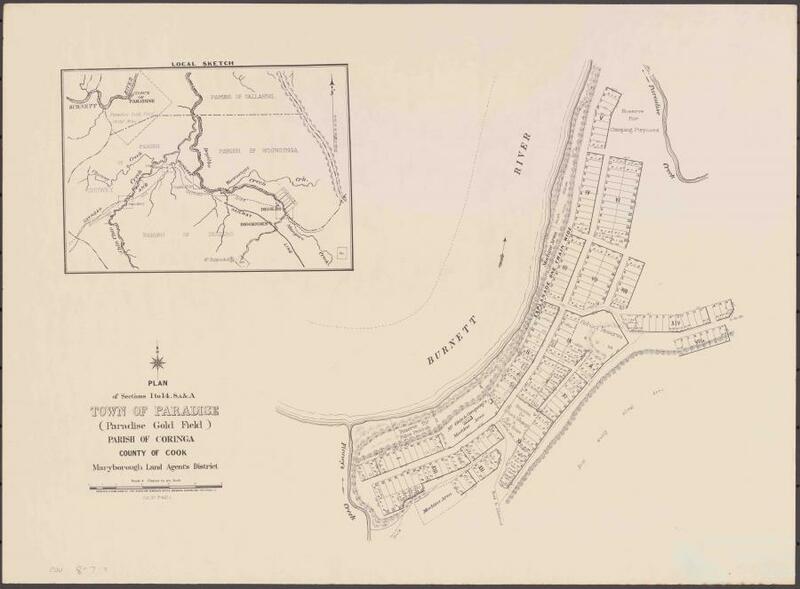 The gold mining town of Paradise once stretched for more than a kilometre along the southern bank of the Burnett River in Central Queensland. 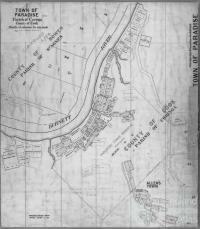 Founded in 1889 and abandoned by 1898, Paradise was an entirely new settlement. Like most gold towns, it had no pre-existing buildings, roads or infrastructure. Paradise presented to its inhabitants a perfect ‘blank slate’ which they might shape into whatever form they chose. Traditionally, it was believed that the result of such freedom would be chaotic, ramshackle towns that reflected the chaotic, ramshackle lives of the miners who built them. Recent research has challenged this perception and re-evaluated the types of people that lived in gold towns, and the type of settlements they created. 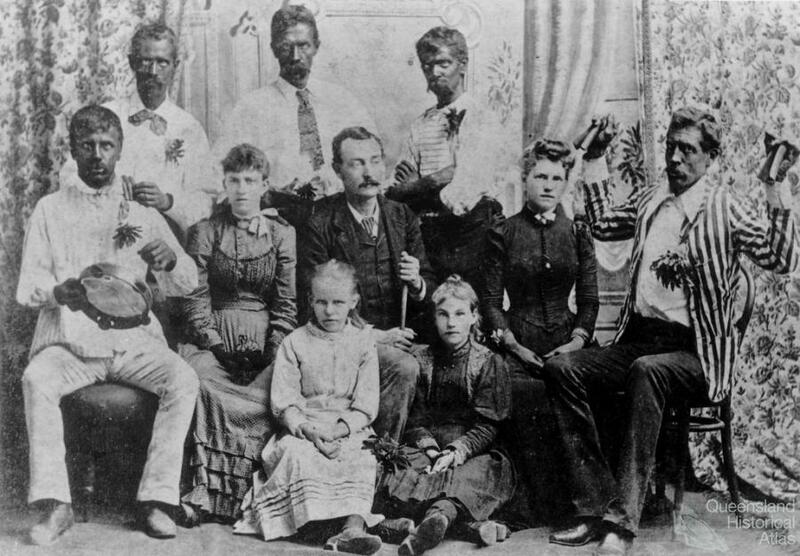 Rather than the wild, masculine gold towns of popular perceptions, most were actually populated by families – by women and children as well as men. 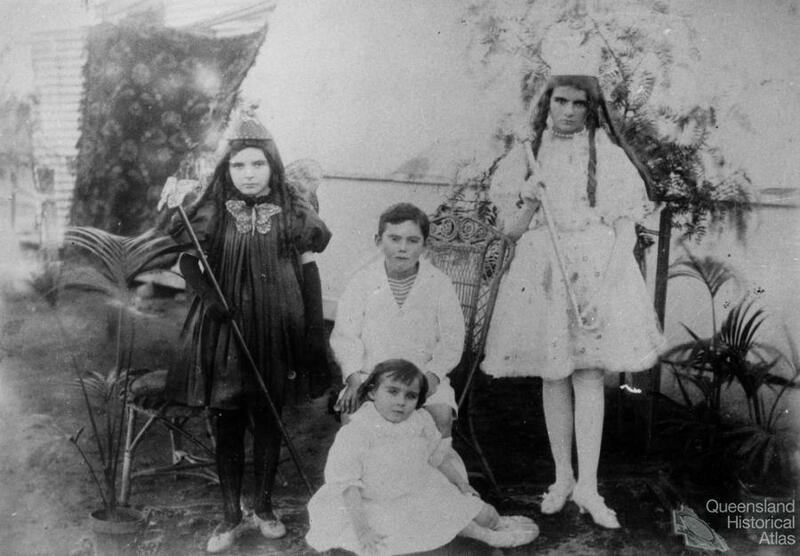 Further, it is plain that these families were not content to permit a disordered, ad hoc settlement to evolve. Rather, they saw in the ‘blank slate’ the opportunity to create what they believed to be an ideal town and Paradise was no exception. Historical and archaeological evidence reveals that in Paradise, as in so many nineteenth century mining towns, this civic ideal seems to have been strongly shaped by the notion of gentility or ‘Victorianism’. A combination of evangelical morality, complex etiquette, and fervour for self-improvement, gentility valued order in all aspects of life. This order prescribed everything from the setting of the dinner table to the layout of towns. The most obvious representation of order in the Paradise townscape is the regular, grid-like organisation of its streets and allotments laid out in the town survey of 1891. Such patterns were a common feature of nineteenth century towns, and so this is not in itself extraordinary. What is extraordinary, however, is the lengths to which the Paradise inhabitants went to have their town surveyed in the first place. 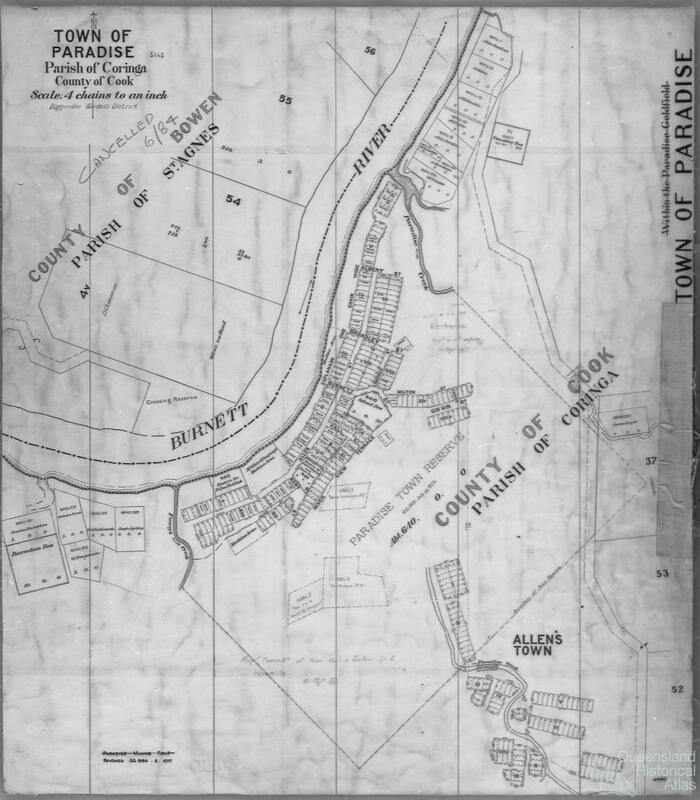 Not content to allow the town to develop in a laissez fair or disorderly manner, Paradise citizens began actively campaigning to have the town surveyed in 1890, ‘so that we will not have people building upon a street, and then have to remove again’ as reported in the Wide Bay and Burnett News, 23 August 1890. Clearly, there was no thought that a town plan might be fitted around the settlement as it already existed – rather Paradise must be made, from the first, to fit to the ideals of an orderly township. Similar sentiments are evident in concerns over the placement of the Paradise school. Even before the survey had been conducted land had been allotted for the school buildings, most likely on the main thoroughfare of Allen Street, where most other major buildings were located. On 30 October 1890, however, the Wide Bay and Burnett News reported that the school allotment had been moved to a more ‘suitable’ location on Riverview Terrace, which ran along the ridge behind the township. This relocation reflected common Victorian notions about the ‘proper’ placement of schools. As places of education, schools needed to be kept separate from physically or morally polluting influences, and should ideally be placed in healthy, natural settings offering plenty of fresh air. The main street of Paradise, dotted with hotels, businesses and industrial complexes was clearly not a ‘proper’ place for children to be educated. On the other hand, the ridge behind the town, with its separation from these corruptions and its prevailing cool river breezes was eminently ‘suitable’. Expressed here is the Victorian sentiment that hotels were places of corruption, and that they were not appropriate for certain members of society, particularly women and children. It is for this reason that local women would not attend events held at Paradise hotels, and for this reason that the town needed a space that all community members could use. Consequently The Maryborough Chronicle of 1 January 1892 reported that a committee had been assembled and fundraising begun for a School of Arts Hall. On March 17, scarcely two months later, the building was completed and opened with a ball that any lady could safely attend. The popular view of gold towns has long been of wild and raucous places. Populated by legions of lone men, they were supposed to be rough, disordered and anarchic settlements. As Paradise demonstrates, however, the reality was quite different. Here is evidence of men, women and children seeking to shape their town according to common Victorian values of order and propriety. The result was not the ramshackle towns of popular conceptions, but rather a very orderly, family-centred community.